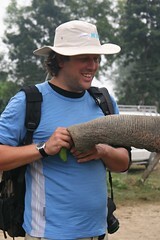 Elephants lurve bananas, as Phil discovered when he bought a few on our elephant jungle safari. You can run, but you sure can't hide from a hungry elephant with the smell of banana in its nostrils. This was just one of so many wonderful moments during our 5 day stay in Chitwan National Park, Nepal, and most of the highlights seemed to revolve around elephants. We did a jungle elephant walk where we were lucky enough to see wild rhinos and wild deer. 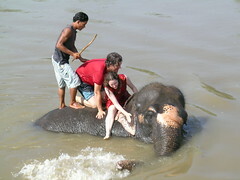 Then we participated in an elephant bathing session, which turned out to be a game of "how many times can the elephant throw Bianca and Phil off its back into the river?" The answer is many, many times, and it just kept getting funnier for the Nepali crowd watching from the river bank. But it was such an amazing experience to be so close to these magnificent creatures. They are so beautiful and gentle and intelligent. Our stay in Chitwan was made even more special because of where we stayed - an eco-lodge called LunTara, where we had our own mud bungalow, were driven around in horse and cart, fed fabulous food and enjoyed the lovely company of its owner Hanna. Big big thumbs up (LunTara).